Qari, I. (2019). The Gender of the Addressee as a Factor in the Selection of Apology Strategies: The Case of Saudi and British. International Journal of Society, Culture & Language, 7(1), 83-95. Israa Qari. "The Gender of the Addressee as a Factor in the Selection of Apology Strategies: The Case of Saudi and British". 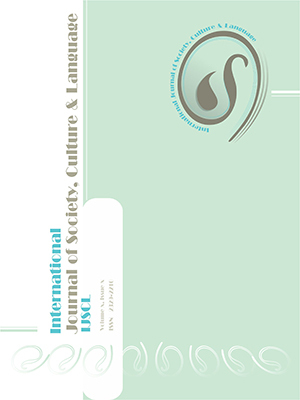 International Journal of Society, Culture & Language, 7, 1, 2019, 83-95. Qari, I. (2019). 'The Gender of the Addressee as a Factor in the Selection of Apology Strategies: The Case of Saudi and British', International Journal of Society, Culture & Language, 7(1), pp. 83-95. Qari, I. The Gender of the Addressee as a Factor in the Selection of Apology Strategies: The Case of Saudi and British. International Journal of Society, Culture & Language, 2019; 7(1): 83-95. This paper was set out to investigate the main cultural differences between Saudi and British participants making apologies with a focus on the role of the gender of the addressee in the selection of apology strategies in gender-segregated vs. coed societies. Written questionnaires were used to collect data from 80 participants: 20 Saudi males, 20 Saudi females, 20 British males and 20 British females. Three apology situations were presented; in the first two situations the hearer (H) was a male, in the third, the H was a female. Data was analyzed based on Brown and Levinson’s (B & L) politeness theory and according to the Cross Cultural Speech Act Research Project (CCSARP) apology strategy coding system. Generally, the results of this study indicated differences between the Saudi and the British apology strategy selections. Moreover, in particular, there were significant differences between the mean scores of apology situations where the gender of the addressee was a male.